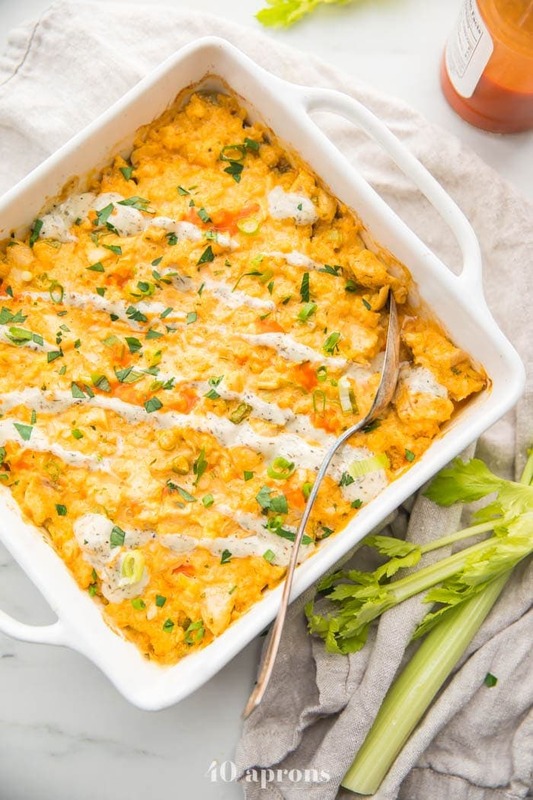 This creamy paleo buffalo chicken casserole with ranch and cauliflower rice is the ultimate paleo buffalo chicken casserole! With a super creamy buffalo-ranch sauce, this Whole30 and keto friendly dinner recipe comes together super easily and is a quick main course you’ll fall in love with. There’s one tried-and-true method of determining whether my, let’s face it, relatively stoic husband is into a recipe: he goes back for seconds. And thirds. If I hadn’t basically shamed him into not eating the entire paleo buffalo chicken casserole recipe, he’d have done just that: eaten the whole entire baker of the stuff. The craziest part? Even my toddler liked it! Well, if I’m being upfront about it: my toddler liked it after he picked off the parsley garnish. That kid is living his best life, and his best life does not include any green foods. I pick my battles. And honestly? I don’t blame them. The buffalo-ranch sauce is super, super creamy and luxurious. I use just the right amount of hot sauce and ranch dressing so neither is overpowering but just right. 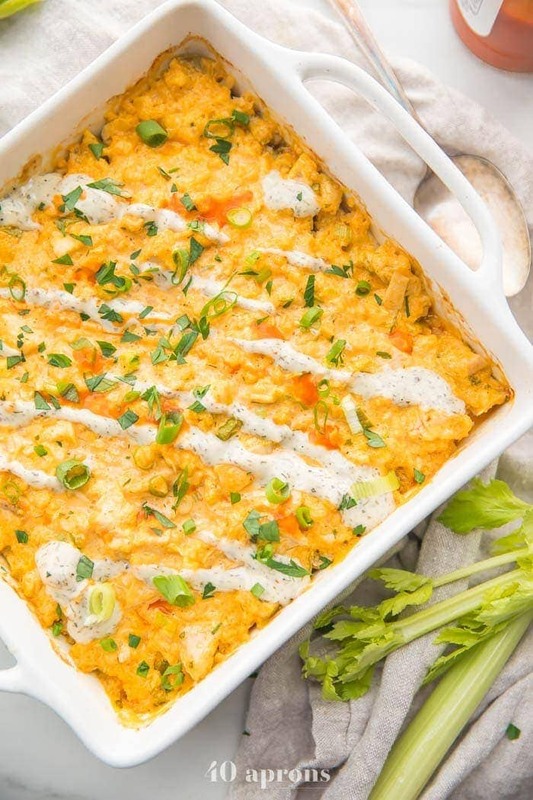 This paleo buffalo chicken casserole uses frozen cauliflower rice and cooked chicken, meaning you can prepare it in just a few minutes. It’s totally Whole30 approved and low carb (only 9 net! ), thanks to the cauliflower rice. When it comes to weeknight dinners, I’m all about the quick and easy but still flavorful. I’d much rather follow a couple extra steps in a recipe than serve up a boring, bland dinner, but that magical combination of packed with flavor and oh so easy? 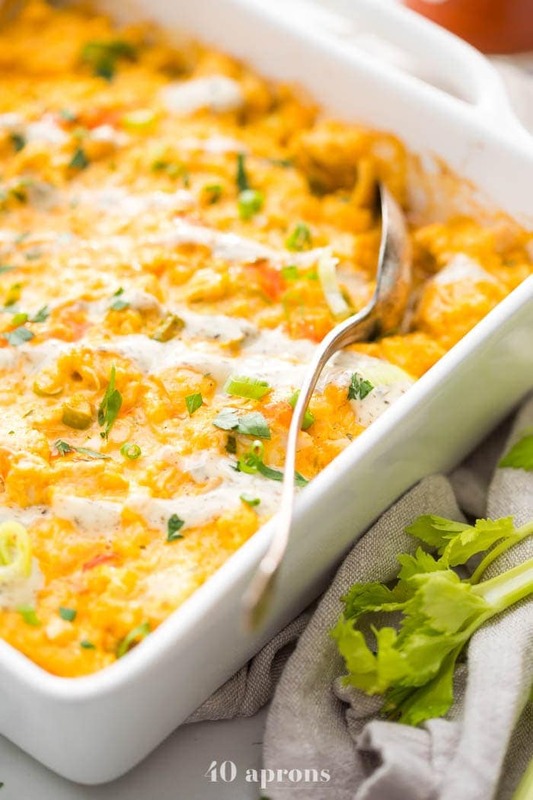 That’s the sweet spot, and this paleo buffalo chicken casserole is totally in it. It uses pre-cooked chicken, whether from a rotisserie chicken (Make sure you get a compliant chicken if you’re on a Whole30! ), leftovers, or a couple extra chicken breasts you baked up during Sunday meal prep. We stir that together with pre-riced cauliflower rice, though you can totally use cauliflower rice you make at home. And the sauce, though it has 5 ingredients, all uses Whole30 ingredients that are super easy to have delivered to your doorstep. Yep. That’s my best life. Their mission to make healthy living easy and affordable for everyone is dead on: I can shop for my favorite healthy grocery items at killer prices from my couch. In yoga pants. Whilst playing Rock ‘Em Sock ‘Em Robots with my toddler. My fave natural, paleo, and Whole30 products are delivered straight to my door, and I never even had to change out of those yoga pants (Though hopefully they’re a different pair than my ordering day yoga pants… but no promises #sodamnpregnant #newbornlife). The prices are fantastic, at 25-50% below traditional retail prices, and the selection is everything I usually have to make a special trip to the natural market in town for! 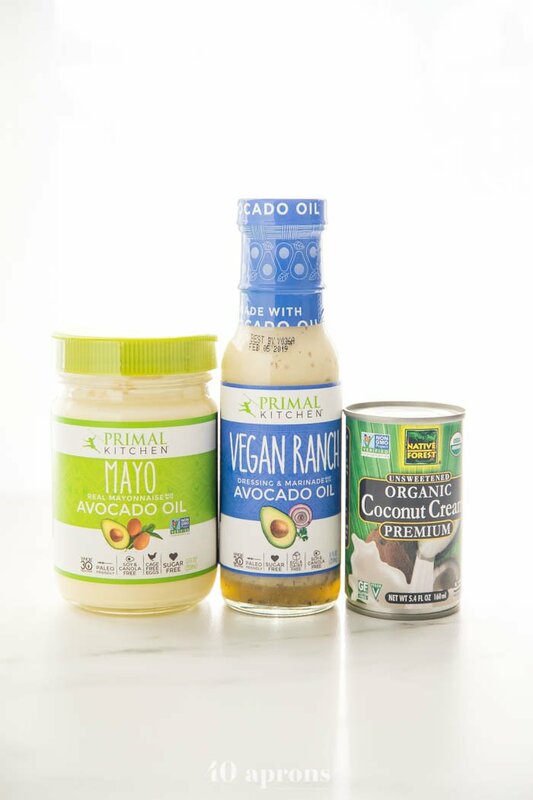 I stock up on my pantry staples from Thrive Market because the prices just seriously cannot be beat! And I’ll talk to literally anyone about it. Seriously, I’ll corner you at the grocery store and tell you you’re spending $3 too much on that coconut oil. Don’t make me corner you at the grocery store. Something else I just love about Thrive: their Thrive Gives program gives low-income families, teachers, and veteran access to natural, organic, and non-GMO foods and products, often for the first time. I live in a city with a major income disparity and too many food deserts, so this hits home for me. And I have personal friends who have benefitted from Thrive Gives, thinking they’d never be able to afford natural and organic products… until then. Just so much love for that. Seriously, if you’re on a Whole30, or if you eat a paleo, keto, or otherwise healthy diet, you’ve got to check out Thrive Market. Easier + cheaper = super win. If you’re not on a Whole30, try blue cheese dressing in place of the ranch! 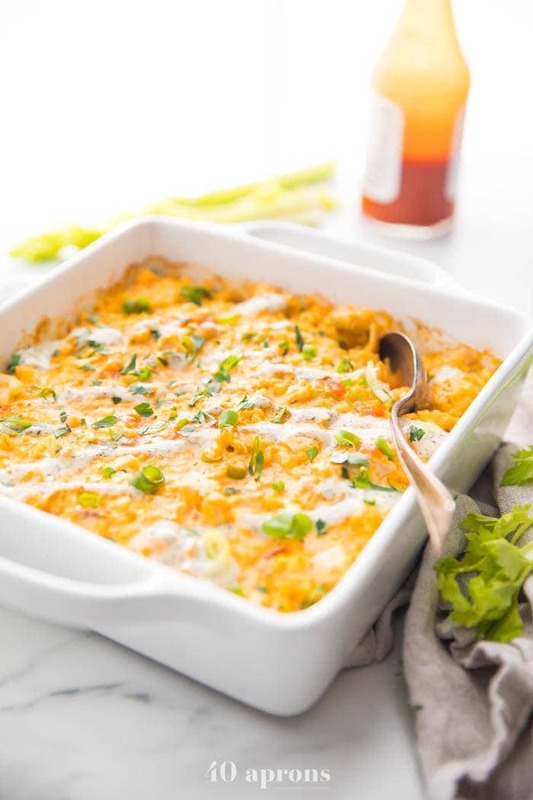 Serve this paleo buffalo chicken casserole with celery sticks or grain-free chips as a creamy, spicy dip. Increase the hot sauce by about 1-2 tablespoons for a spicier sauce. 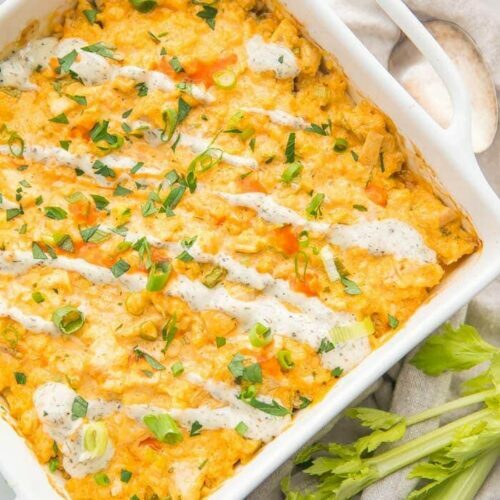 Use frozen cauliflower rice to make this paleo buffalo chicken casserole even easier. If you don’t have pre-made Whole30 ranch dressing on hand, make my Whole30 dump ranch dressing recipe. Use only the solid white part of the can of coconut milk or cream. Reserve the rest for a smoothie or other use. Ready for this? Get your notepad, girl. Whisk all the sauce ingredients together in a medium bowl. 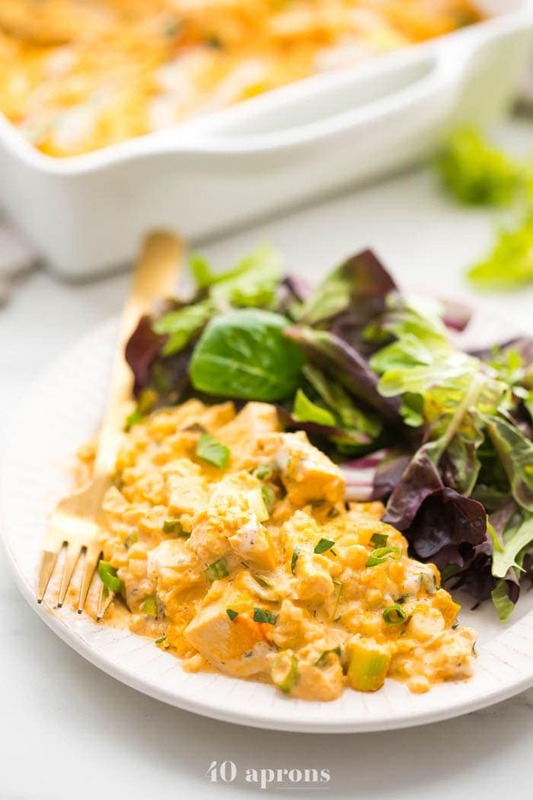 Stir together all the paleo buffalo chicken casserole ingredients together in a large bowl, then pour sauce over and toss to coat. Bake for 30 minutes at 350º. DONE. Hero. 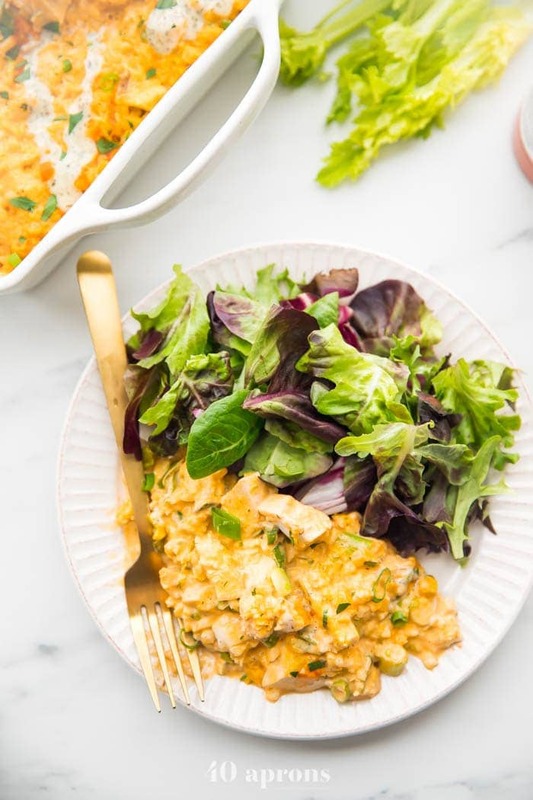 A creamy paleo buffalo chicken casserole with ranch dressing and cauliflower rice that's so easy to make for a healthy weeknight dinner. With a super creamy buffalo-ranch sauce, it's so filling, too. Whole30, low carb, keto friendly. Combine chicken, cauliflower rice, and 1 cup green onions in a large bowl. In a medium bowl, whisk together all sauce ingredients. Pour over chicken-rice mixture and toss to coat well. Transfer to a 9x9" baking dish. Bake 30 minutes or until bubbly. Garnish with more ranch dressing, green onions, and freshly chopped parsley. Serve with celery sticks, if desired. If you use frozen cauliflower rice, there's no need to thaw before assembly or baking. This was seriously amazing. And I HATE cauliflower!! The sauce was so creamy! Great recipe. I’m assuming the chicken should be cooked prior to combining?? Looking forward to making this! Wow! This recipe was really delicious! I shredded the chicken in my food processor and used the frozen cauliflower rice. I do want to add though that I was a bit nervous to add the coconut cream… so I didn’t. It may not have been super creamy because of the missing ingredient but man the flavor was really great! I put some shredded carrots on top of it and loaded it in some romaine lettuce and Napa cabbage leaves. This looks fantastic. Just wanting to make sure – this recipe calls for 1 cup green onions? I can’t wait to try it!! So excited to find your site! Do you have a recipe for the creamy buffalo ranch sauce? That’s actually just the heading 🙂 The ingredients follow!